I’ve never understood the point of having fake fruit. I’ve been in people’s homes and seen coffee tables and dining rooms alike adorned with centerpieces made up with hollow rubber grapes, plastic apples and bananas, and wooden pears. I get that there is a certain look people are going for but to me fake fruit is just not going to do it. I’m no Martha Stewart but I’d rather rotate some Yankee Candles throughout the year or even a vase. Fresh fruit is healthy, and it has a sweet taste. Plastic fruit is definitely not healthy, and really has no taste to speak of (or so I’m told). It was never made for eating, but is a manufactured waste of space designed to look like something that is beneficial in real life. Seriously, what makes someone plan a trip to a store, walk through the aisles, and then spend actual money on fake fruit? It seems that buying a steady supply of real fruit and eating it would be more enjoyable and healthy, especially considering the type of food that is popular around me as I type this in Texas. Christians are familiar with the biblical metaphors such as fruit and harvest and other living things as they pertain to the results of our lifestyle and choices. There is the Fruit of the Spirit, the parable of the sower, and even a comparison and contrast between favorable crops and weeds, to name a few. The Bible uses this language to illustrate a favorable life dedicated to the purpose and plan of God’s Gospel, and contrasts it with useless behavior and wasted opportunities, and even the outright rejection of Jesus Christ. Fake fruit can’t feed anyone. Fake fruit doesn’t look as impressive to others as you might think. Fake fruit will never become anything other than a lifeless decoration. Fake fruit is just a copy of the real thing. 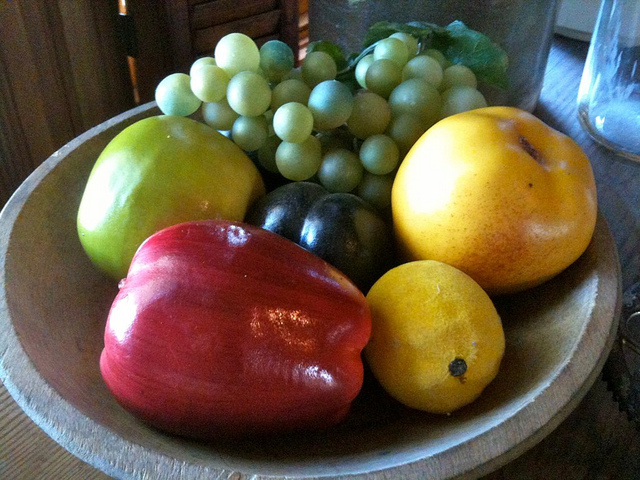 Let’s benefit from the “fake fruit” metaphor: Are you willing to replace the fake fruit in your own life? Are you strong enough as a leader to examine your church or ministry and free up the resources currently used up for the fake stuff? Are you convinced your message to the world is truly harvested from Scripture by the Holy Spirit, or are you piecing together some lifeless, plastic imitation because you think it looks nice? Is the actual life you’re living producing anything healthy and life-giving, or are you adding more fake fruit to an already saturated market? No more fake fruit. Skip the transition period and just toss that stuff in your trash can. No more excuses. Stop living life to impress the fake fruit manufacturers. Stop living a life that runs past the strangers you’ve let your neighbors remain just so you can get back into the church building and show off some new fake fruit. Don’t let your church or small group be a place where the only things on the menu are plastic apples and wooden pears. Don’t waste your entire life on things that are just designed to impress others or boost your self-esteem.